Volkswagen of America, Inc. is proud to announce a landmark integrated sponsorship with the U.S. Soccer Federation, making Volkswagen the presenting automotive partner to U.S. Soccer through 2022. In conjunction with Soccer United Marketing (SUM), a U.S. Soccer partner of 15 years, the agreement was announced today during Volkswagen’s press conference at the 2019 North American International Auto Show in Detroit, Michigan. U.S. Women’s National Team coach Jill Ellis announced that Volkswagen’s initial contribution to the partnership would be funding programs and providing assistance to produce more women coaches. While 47 percent of youth soccer players are women, only 15 percent of coaches are female. Over the four year commitment, Volkswagen will aid U.S. Soccer in its mission to become the preeminent sport in the United States through increased visibility, player and coach development, and promoting greater fan engagement across the country. 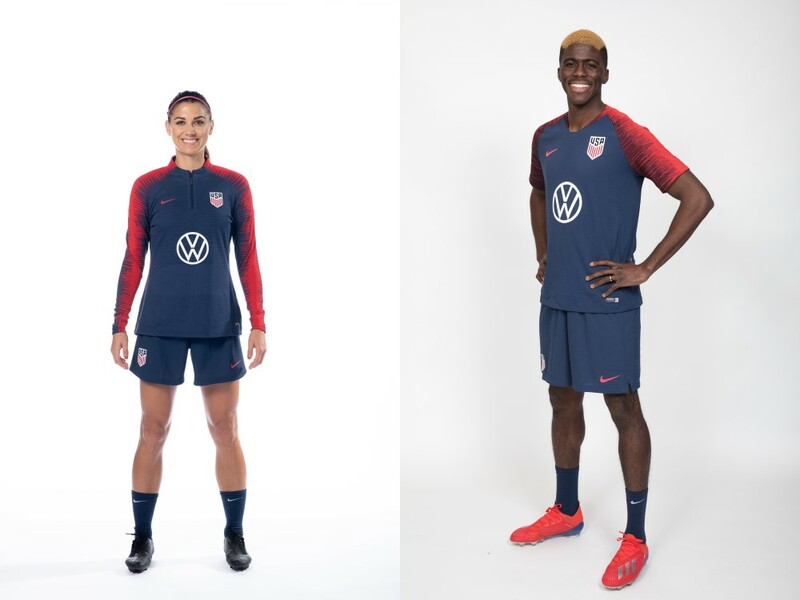 At the National level, Volkswagen branding will appear on the training jerseys of U.S. Soccer National teams, including the Women’s and Men’s National Teams, all Youth National Teams, and the Para 7-a-side, Beach and Futsal National Teams. Volkswagen’s visibility will continue via prominent in-stadium and training camp placements on U.S. Soccer creative materials, a significant presence in the organization’s social media and digital efforts, and status as presenting partner of the Tournament of Nations – a round-robin international women’s tournament held every non Women’s World Cup or Olympics year. Coming at a time when Volkswagen plans a major shift towards automotive electrification, the pairing also marks an exciting point in history for both U.S. Women’s and Men’s National Teams. Finishing as the number one ranked team for the fourth consecutive year, the U.S. Women’s National Team hopes to inspire a nation when it seeks to capture its second straight world title at the 2019 FIFA Women’s World Cup in France. Team USA finished 2018 with an unbeaten record of 18-0-2, marking only the fourth time that the Women’s National Team finished a calendar year where it played 10 or more games without a defeat. Having collected the 500th victory in program history, head coach Jill Ellis will lead the team through a 10-game Countdown to the Cup tour in 2019 prior to departing for France. Now under the helm of two-time World Cup veteran Gregg Berhalter, the U.S. Men’s National Team embarks on a four-year journey to reach the 2022 FIFA World Cup. As the only person to represent the United States as a player at the World Cup and then coach the squad, Berhalter will command the next generation of highly talented prospects and experienced veterans with one focus – to implement a potent combination of style of play, pride and commitment that will make all of the team’s fans and supporters proud.